Pat, A great discussion you started here. I appreciate it very much since I've been studying the Kanrin Maru (ex-Japan). I missed the discussion on coal preservation, but I'll add that the Kanrin Maru only carried enough coal for 6 full days of steaming. Presumably, the engines were intended for use primarily for travelling into and out of port. For the most part, the fledgeling Japanese Navy (all trainees) used it primarily under steam – I guess they kept close to port. 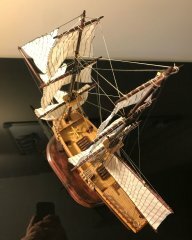 When she crossed the Pacific, she was under sail the whole time. 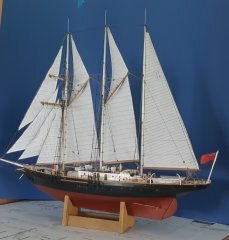 The USS Saginaw, a topsail schooner rigged side-paddlewheel steamer of 1859, spent a year operating only under sail. I can't remember which year was referred to. I believe Perry's mission to open Japan was in part to secure safe harbors with supplies of coal. As for sail names. Lt. John M. Brooke kept a detailed log of his journey aboard the Kanrin Maru from Edo (Tokyo) to San Francisco. 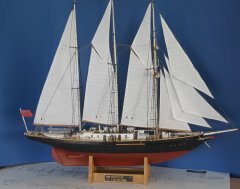 As I mentioned earlier, the Kanrin Maru has the same sail rig as you've been discussing and was referred commonly referred to as a bark. 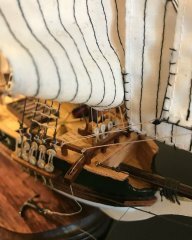 Brooke specifically mentions the gaff rigged sails, calling them "trysails". James, it seems I was digging too deeply through the review and didn't spot the obvious! Yes, you are right, once you watch a video, the current will take you to the others. Hi Will, Looks like you are doing an excellent job with this model. I personally really like this line of Constructo kits, as I think they are enough of a challenge for first time builders, yet provide a taste of most of the tasks that will be faced with bigger kits. 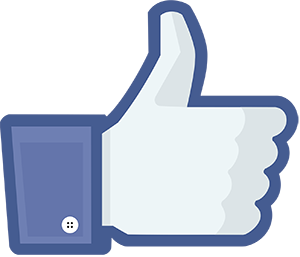 Also, it gives you a good platform to modify and upgrade to make it as complicated or as simple as you want. Regarding the rigging instructions, to be fair, I think rigging is really hard to explain, and most of it is better left to diagrams to show you where things go. 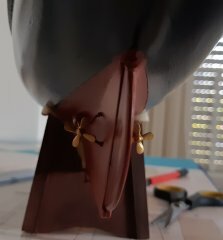 If you looked at written instructions on rigging, you might be tempted to put the kit back up in your closet for being too much to deal with. Anyway, there's plenty of help here on MSW if you need it. Well, I couldn't help it... 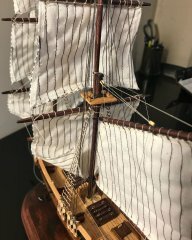 I was at Ages of Sail, picking up items to take to tomorrow's IPMS show in San Jose (I'm manning the Ages of Sail table at this event), and they had the HMS Terror kits there – the shipment just came in. Not that I need another project to start, but I also want some experience with OcCre kits for my own blogging purposes. At least, that's my excuse for spending more money on yet another kit. Anyway, it's a great looking kit, and the Building Terror Blog is great material and inspiration for making an even better model. Looking forward to the build. 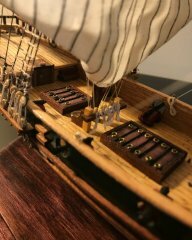 Christos, you did a fantastic job on this model. I am very impressed with how nicely it turned out. Well done! Absolutely fabulous job on the Sir Winston Churchill, Christos. Very nicely done! 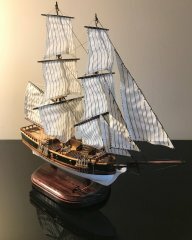 That's a really nice looking kit and I've been eying for some time, as Ages of Sail has been carrying this and many other Disar Model kits since... mid-2017. The Atrevida is one of the better selling kits. So much so, that it's out of stock. I'm waiting to hear when the next shipment is expected to be, but there are many other Disar Model kits you can find there. I can vouch for the plane from Lee Valley Hardware that Jack posted. I LOVE this thing. Been using it for just under a year now. Beautiful job, JCT. 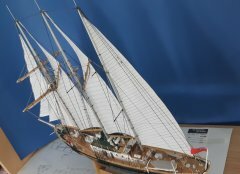 This may be the nicest Harriet Lane build I've seen. I still have to finish my USS Saginaw, another side paddlewheel steamer, and you're giving me a lot of inspiration. Well done! There are no Barbary Pirate kits per se. But, what you're probably looking for is a Xebec model kit. Amati and Occre both make kits in 1:60-scale, though I thought the Occre kit was a bigger scale. Anyway, these are about as close as you're going to get. The Amati kit is a little shorter than your Enterprise model and the Occre kit is a bit longer. 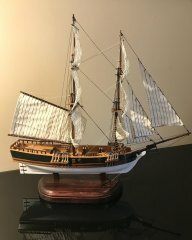 You can find them online, but Ages of Sail has them both. 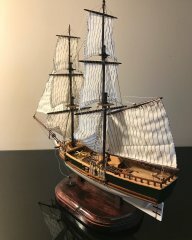 Here are links to them: https://www.agesofsail.com/ecommerce/amati-xebec-am1427.html https://www.agesofsail.com/ecommerce/cazador.html I've seen beautiful builds of them both. 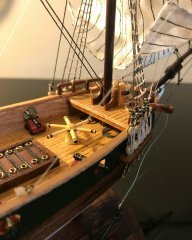 This is a wonderful build of this kit – best I've seen! Congratulations on such a fine job.